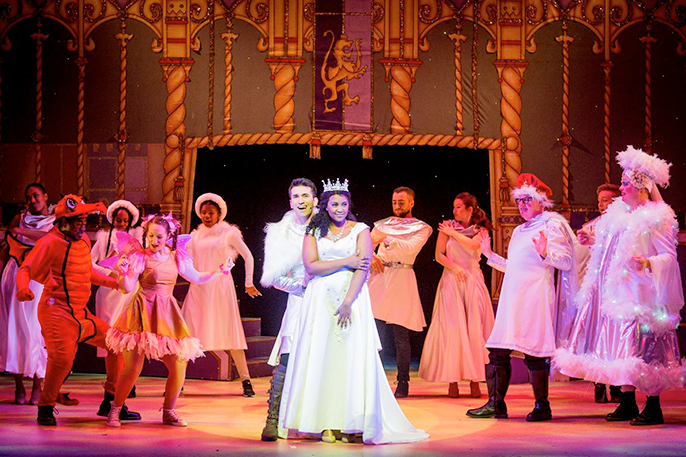 Afridiziak Theatre News had a chance to catch up with Alexia Khadime now performing in Hackney Empire's pantomime, Sleeping Beauty. How is it working in Hackney Empire? My first professional role was here in the Hackney Empire and I was one of the youngest in the company. We were doing another fairy tale, Cinderella at the time. I then went on to perform in Leader of the Pack and toured the UK. It is amazing being back here as it’s like being part of a family; everyone gets on so well and helps one another. We have such a busy schedule that it’s important that we all get on and support each other. Some of the cast are going through lines right now, learning all of the lines to ensure that if anything happens someone can step in as an understudy. When did you realize that you could sing? As a child I thought that everyone could sing as a lot of people around me could sing like cousins, family, and friends, I just assumed that everyone could hold a tune. I remember organising shows and mini concerts with friends from school. We would practice in each other’s bedrooms and I would always be in charge with production and timing. Then we would perform for our families and friends it was hilarious. But there was no epiphany moment when I realised that I could sing, I just know that I always loved singing and people like to hear me sing as well. There’s a lovely part where I’m lying down onstage and I can hear the children in the audience singing back a song and it’s so touching. The lovely, rewarding part of being in a panto is the reaction from kids, it puts a smile on my face every time. No I don’t get stage fright but I have to admit I do get first night nerves, whenever I’m doing a new show, on the first night I will get nerves and butterflies in my tummy, but I think that’s normal for any performer. Also you never know how the audience are going to react and each night is different with a different audience. What is your favourite part of the current production Sleeping Beauty? I can’t give too much away as I want people to come and be surprised but there’s a lovely part where I’m lying down onstage and I can hear the children in the audience singing back a song and it’s so touching. 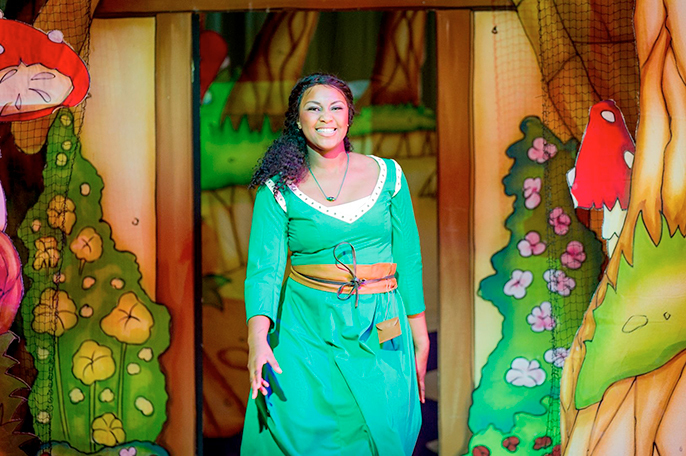 The lovely, rewarding part of being in a panto is the reaction from kids, it puts a smile on my face every time. You must always look after your craft and don’t take it for granted as you never know what’s around the corner. Take professional lessons, get a voice coach and never stop doing that throughout your career. My story isn’t the traditional drama school story, I went to normal school and took drama classes after school. I was lucky enough to get an agent through these classes but back then I didn’t think that this was going to be a career. I was studying English Literature, Maths and Psychology, I really loved Psychology and did drama classes as an extra hobby. To land a role at 17 was amazing but even then I didn’t see it turning into what it has for me today. 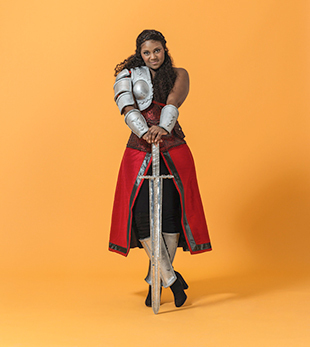 How do you celebrate landing big roles like your roles in Wicked, Lion King and Book of Mormon? You’re an inspiration to many young, black women as you were the only black woman to play the role of Elphaba full-time in any production of Wicked around the world. That’s huge. I don’t really celebrate; I guess I would have dinner with friends or family. I can remember when I landed Wicked I was on the cast at Lion King and they threw me a surprise party backstage which was so wonderful, and they all came to my opening night for Wicked which was just amazing. It’s like a big family in theatre, the bonds and friendships that you make last forever and we stay really close. What advice would you give to someone who wants to get into the industry? (In 2011 Fisher was diagnosed with congenital sulcus vocalis (holes in her vocal cords). This seriously affected her singing and general speaking voice, after three operations in the US Fisher was told she would never sing again and stopped singing professionally). Her experience and story was so humbling for me, as being able to sing is a really big part of me and my identity. For it to be taken from me would be heart-breaking, my heart really went out to her. This story reminded me that you must always look after your craft and don’t take it for granted as you never know what’s around the corner. Take professional lessons, get a voice coach and never stop doing that throughout your career. What do you when you’re not on the stage? I love knitting and baking, a bit of domesticity I get that from my mum. When I get a chance at home I’m doing some new baking, I love to bake cakes for my cast and crew, my speciality is a red velvet, everyone loves that. Well I don’t want to give too much away but I do want to shake things up a bit and do more TV. I love the theatre but it would be good for me to do more TV work. I absolutely love Shonda Rhimes, (Grey’s Anatomy, Scandal, How to Get Away With Murder) and everything that she makes. If she was doing something in the UK I would love to work with her. To be honest if I had a chance I would go to the States to be in one of her shows she is incredible. 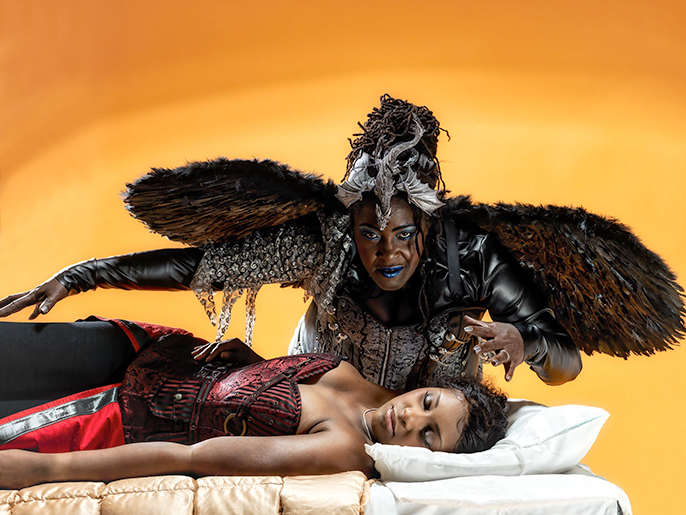 Info: Alexia Khadime is playing Princess Tahlia in Hackney Empire's brand new pantomime, Sleeping Beauty, which is showing until 8th January 2017.